For those most familiar with Adrienne Rich from her classic work "Diving Into the Wreck" and high school or college class discussions, this lovely collection is an ideal starting point for deeper exploration. With her timeless vision and keen sense of page, Rich writes of relationships, sisterhood, motherhood, love and so much more. Encompassing works from 1974 to 1977, there is sure to be something for every poetry reader, novice to master, inside this truly accessible collection. 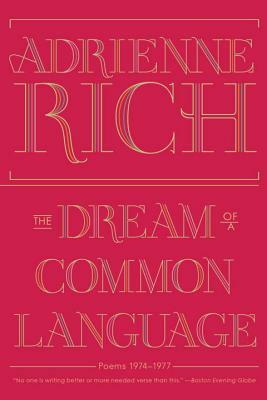 The Dream of a Common Language explores the contours of a woman's heart and mind in language for everybody language whose plainness, laughter, questions and nobility everyone can respond to. . . . No one is writing better or more needed verse than this. Boston Evening Globe.